Cerebral Palsy, referred to as “CP”, is a neurological disorder result from a brain injury or malformation that is caused while the child’s brain is under development. The injury can occur before, during or after birth. It can also result from abuse, medical malpractice, infections, and accidents. Having CP can affect ones muscle control, coordination, and tone, as well as reflex, balance, posture and body movements. It also can affect fine and gross motor skills, and motor function. Hyperbaric oxygen therapy is a great alternative treatment to help improve symptoms associated with Cerebral Palsy. 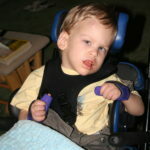 How can Hyperbaric oxygen help Cerebral Palsy? Under pressure, oxygen can get to the damaged tissues of the brain and reduce tissue swelling by constricting blood vessels and interrupting the vicious cycle where oxygen lack leads to tissue swelling, which then leads to further oxygen deficiency. Many children with Cerebral Palsy have been able to gain muscle control, reduce seizure activity, improve speech and fine motor skills, gain the ability to swallow, and more after receiving hyperbaric oxygen therapy. Do you have a loved one with Cerebral Palsy? Give us a call today and get your child on the path to an improved quality of life. Note* Hyperbaric oxygen therapy is an adjunctive therapy and should be used along with speech therapy, physical therapy, and other alternative treatments to optimize healing. Hyperbaric oxygen therapy is not approved by insurance for Cerebral Palsy in the state of Virginia and is still considered investigational. This is not to be considered medical advice.